UAE-based Etihad Energy Service Company (Etihad Esco), a wholly-owned subsidiary of Dewa, has partnered with Abacus Lighting to fully retrofit Dubai Golf’s 18-hole golf course located in Dubai to replace its existing metal halide solution with LED lighting. The new sustainable lighting system is set to improve the overall quality of light across the golf course, covering a total area of 6.08 million sq ft and bring up to 60 per cent energy savings for the company. It will use one of the lightest high-performance LED floodlights in the market, weighing only 22 kilograms, including an integrated driver, it stated. The lighting system is expected to give light to the course for up to 15 years, it added. CEO Ali Al Jassim said: "Luxury leisure and recreation venues in Dubai could be high energy consuming and moving towards an environmentally-friendly approach to providing such facilities in Dubai is testament to the increasing awareness towards energy sustainability in the UAE." "Our strategic agreement with Dubai Golf to implement the first LED lighting retrofit in a golf course in the region is a welcome move that shows leadership in promoting energy efficiency and we commend the company for taking this important step," noted Al Jassim. "This partnership further supports the Emirate’s efforts to achieve 30 per cent reduction in energy consumption by 2030 and brings us another step closer towards meeting our sustainability goals," he added. Abacus Lighting, which will install the LED lights, has been working for more than a year to create multiple design options that will ensure the project will be implemented with the optimum solution in line with Dubai Golf’s requirements, primarily considering the quality of light, energy consumption and ease of implementation. The advanced technologies to be used in the retrofitting project also promotes Dubai’s efforts to tap technological innovation in line with the Smart Dubai 2021 strategy, as the installation process is designed to be unobtrusive to players’ golfing experience any time of the day or night. Dubai Golf CEO Christopher May said: "We place huge importance to golfers’ playing experience especially at night and we maintain the highest standards for the championship golf course which has been hosting many international tournaments." 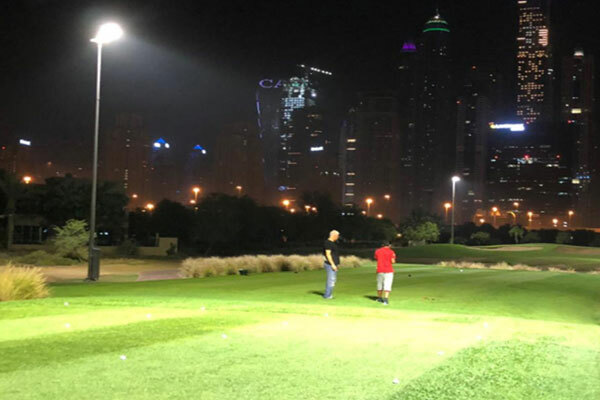 "It is only fitting that we shift to a more ecologically sustainable lighting system and we are excited to be the first in the region to have a LED-lit 18-hole golf course that also contributes to attaining Dubai’s vision to become a truly sustainable city," he noted.